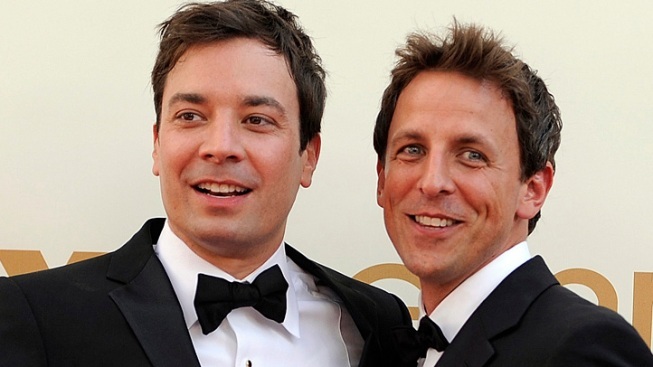 This Sept. 18, 2011 file photo shows Jimmy Fallon, left, and Seth Meyers at the 63rd Primetime Emmy Awards in Los Angeles. Meyers is moving from his "Weekend Update" desk to his own late night show on NBC. 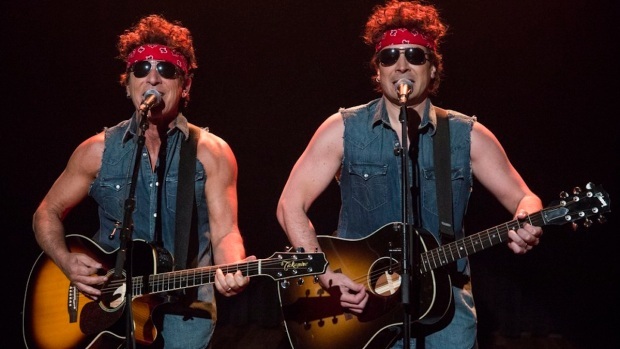 The longtime "Saturday Night Live" cast member will replace Jimmy Fallon at the 12:35 a.m. "Late Night" show. Fallon will be moving up an hour as Jay Leno's replacement on the "Tonight" show. Asked by E! News if he had any advice for incoming "Late Night" host Seth Meyers, Jimmy Fallon had exactly one tip. "Make friends with Justin Timberlake," the next host of "The Tonight Show" advised his future replacement. Alas, Timberlake probably won't be able to hang with Meyers every night, but the singer/actor/"SNL"-fave is indeed a great guest! Amy Poehler has been announced as Meyers' first guest when he officially takes over "Late Night" on Feb. 24--but he may as well look into booking J.T. soon after. Meyers, who's been head writer at "Saturday Night Live" since Tina Fey left, is a pro though, and as he told Ellen DeGeneres in an interview that aired Tuesday on "Ellen," he's excited to be able to crack jokes every night of the week instead of just on Saturdays. "I'm most scared about this part, about interviewing people," he admitted, gesturing between host and guest. "I've never done that before. I interview people on 'Weekend Update' but they're all fictional characters." Ellen, of course, offered up a hypothetical list of interview situations for Meyers to true out. Asked what he would say to Kanye West should he have a chance to sit down with the rapper, Meyers began with, "Great to see you, Kanye. Nice sunglasses--you're inside. "Um...I would say, 'Was your video with Kim Kardashian, was that green-screened or did you actually drive a motorcycle across America?'" "'Kim, you look beautiful,'" Meyers suggested. "'Who do you think loves your husband more, you or your husband?'" Well, when he actually has a chance to do research and brainstorm before these interviews, surely he'll be a pro.